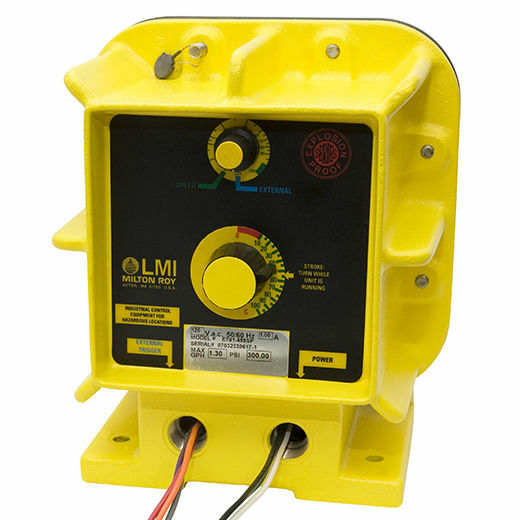 Designed for environments that demand additional safety features, the E7 Explosion-proof chemical metering pump delivers the protection your chemical application requires. Built with a rugged urethane coated cast housing, the E7 Series is designed specifically for hazardous environments and remote use. It meets or exceeds all standards for Class I, Division I, Groups C and D; Class II, Division I, Groups E, F and G.
Available with manual or external controls without the need for costly motors. The robust design of the E Series make it the right choice for hazardous chemical addition applications that require additional safety precautions.